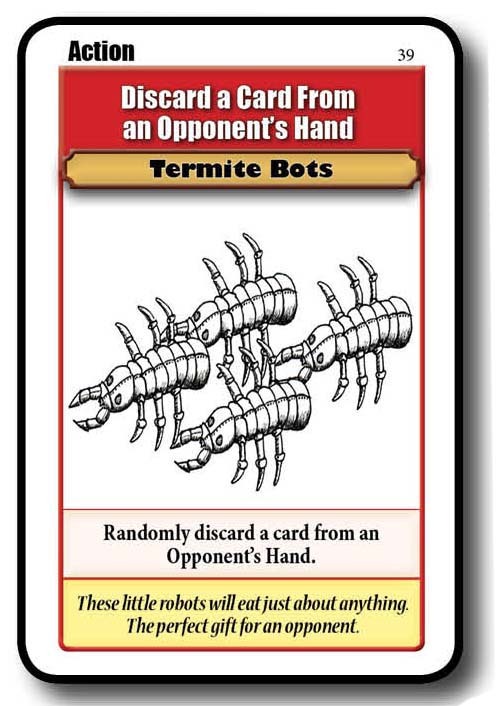 These cards are also used to help you build your device and defend against other player’s attacks. Instant Action cards do not count as an action when you play them, so you can play as many as you want. Because they do not count as an action, they also don’t count as your one action for a round, unless you Discard it. You can also play an Instant Action Card whenever you want, whether it is your turn or not. Draw 1 Extra Card - Draw one extra card from the Deck. 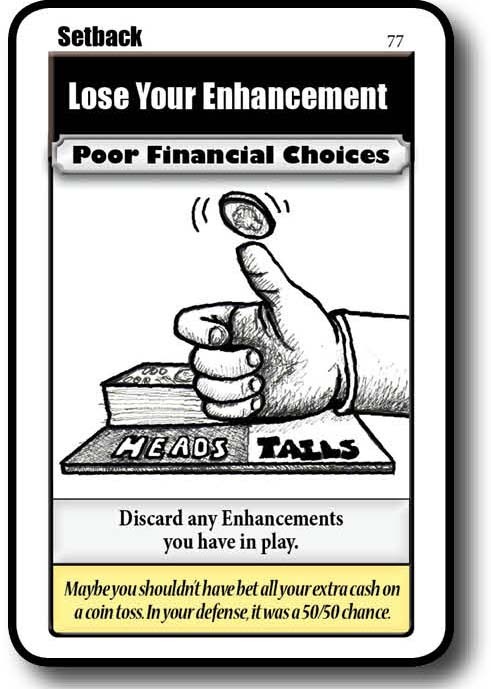 If this extra Draw is a Setback Card, it goes into your hand and doesn’t affect you. Draw 2 Extra Cards - Draw two extra cards from the Deck. 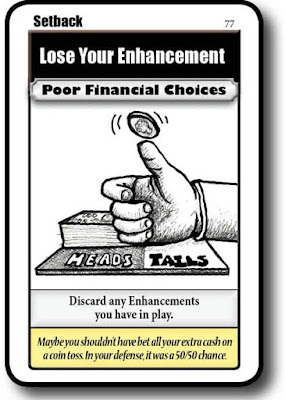 If this extra Draw is a Setback Card, it goes into your hand and doesn’t affect you. 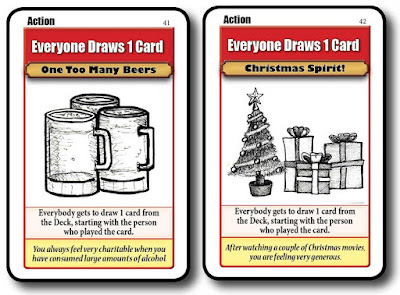 Draw 3 Extra Cards - Draw three extra cards from the Deck. If this extra Draw is a Setback Card, it goes into your hand and doesn’t affect you. Take 1 Extra Action - If you play this card on your turn you can play one extra card on your turn. 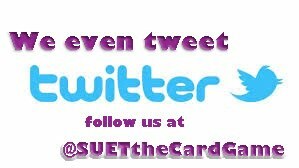 If you are unable to play the extra card, you cannot use this card. Remember, Instant Action Cards do not count as an action. You must play this card on your turn. 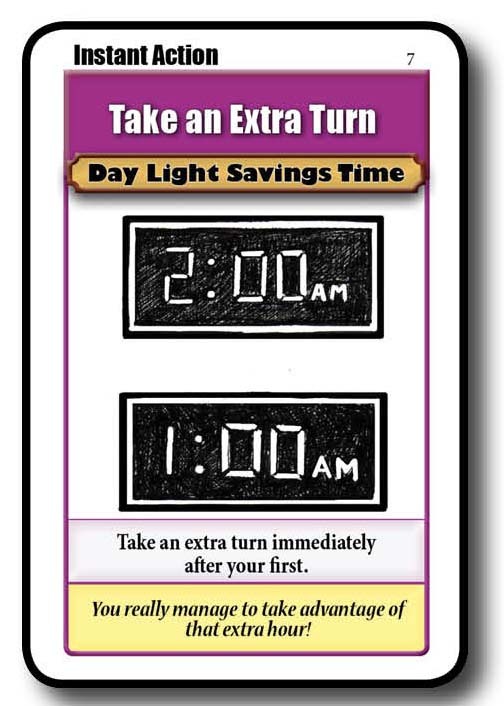 Take 2 Extra Actions - If you play this card on your turn you may play up to two extra cards on your turn. Remember, Instant Action Cards do not count as an action. You must play this card on your turn. 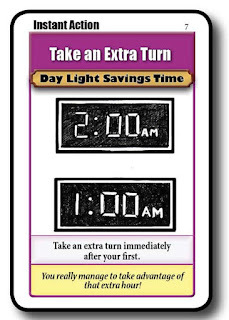 Take 3 Extra Actions - If you play this card on your turn you may play up to two extra cards three extra cards on your turn. Remember, Instant Action Cards do not count as an action. You must play this card on your turn. Block an Action (3) - This card will block any Action or Instant Action Card played by another player. Block an Action Cards can be cancelled out by other Block an Action Card. 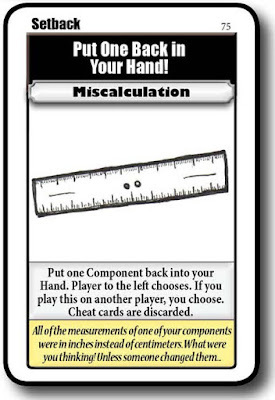 Cheat Card (3) - You play this Card with another player’s Component to use it as your own. Place it behind the Component in your Lab. 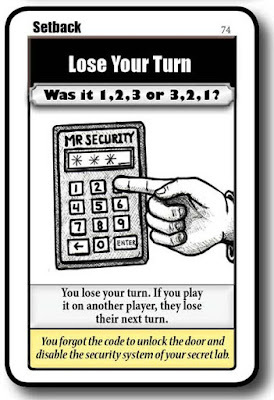 If the Component that it is with is moved in any way (Discarded, Stolen or Sent to your Hand) the Cheat Card is discarded. 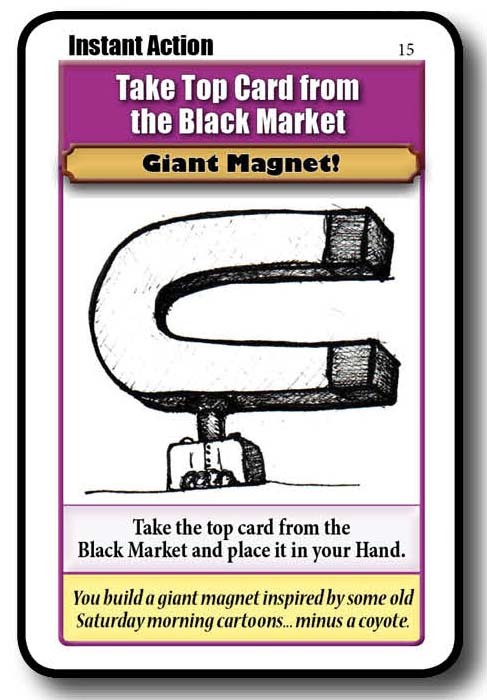 Take Top Card from the Black Market - Take the top card of the Black Market and place it in your Hand. In the Long Game, it does not have to be a Black Market round. These cards are not only used to help you in your efforts to build your doomsday device, but also to make things harder for your opponents. 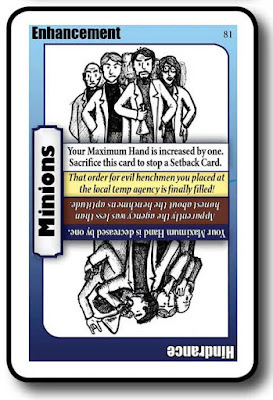 Each Action card you use is considered one action so unless you are able to increase the number of actions you get, you can only play one on your turn. Here is a list of the individual cards and a brief description of what they do. 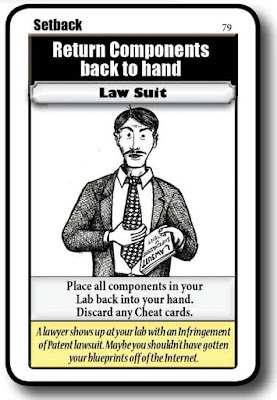 Steal a Component (3)- Take a Component from another player’s Lab and place the card in your Lab. 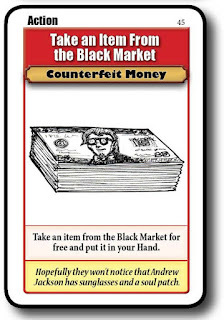 If you can not use it than send it to the Black Market. Cheat Cards will be discarded. Break a Component (3) - Break an opponent's Component. Flip the card so that the Break side is facing up. 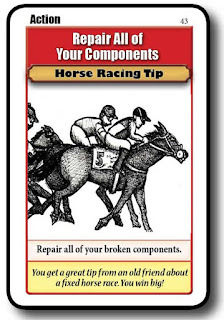 Repair a Component (6) - Repair one of your Broken Components. Flip the card back to it’s original position. In the Long Game, the Color Round does not matter playing this card. 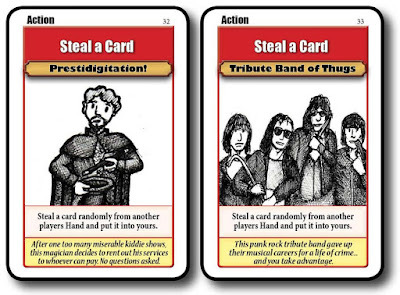 Steal a Card (2) - Take a card at random from another player’s Hand. If you play this with certain Instant Action cards (ie. Look at Opponent’s Hand), then the selection is not done randomly. The player who played the card can pick whatever card they choose. Trade Hands - Switch your hands with an opponent’s. 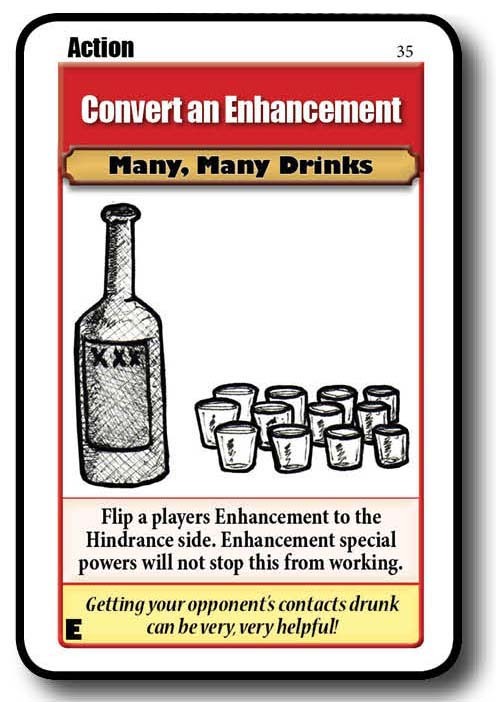 Convert Enchantment - Converts an Enhancement to its Hindrance side. Flip the card around so the Hindrance side is facing up. 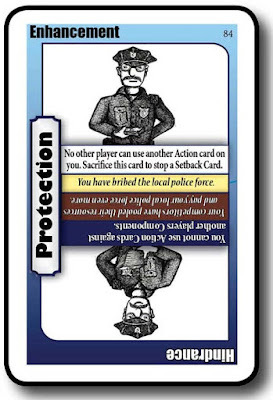 The Protection Enhancement Card will not prevent this card’s effect. Remove an Enchantment - Place an opponent’s Enhancement Card onto the Discard pile. 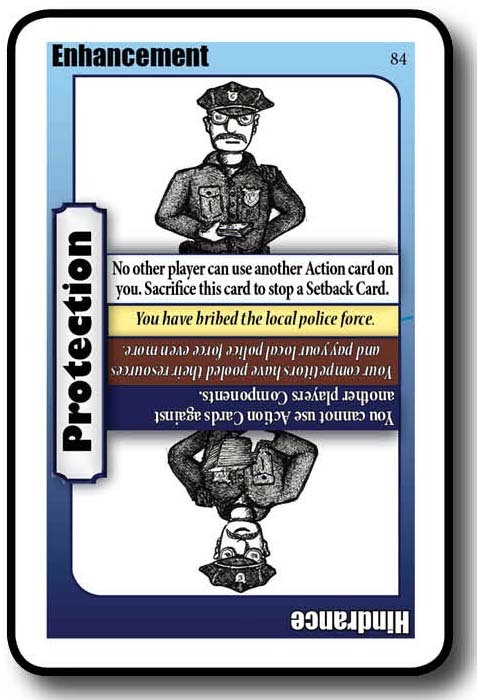 The Protection Enhancement Card will not prevent this card’s effect. 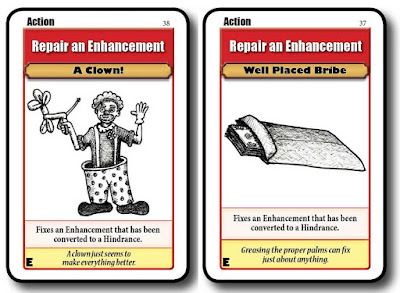 Repair an Enhancement (2) - This card will turn an Enhancement Card that has been converted into a Hindrance back to an Enhancement. Just flip the card back to it’s original position. Discard a card from an opponent’s hand - Randomly discard a card from someones hand. If you play this with certain Instant Action cards (ie. Look at Opponent’s Hand), then the selection is not done randomly. The player who played the card can pick whatever card they choose. 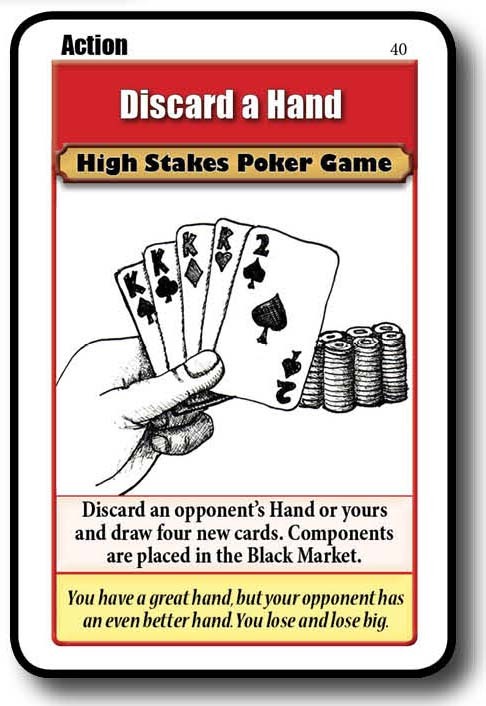 Discard a Hand - Place an opponent’s entire Hand, or your own into the Discard Pile unless they are Components. They will go to the Black Market. Whoever discarded may now draw four new cards. Your turn ends when you redraw your hand unless you draw an Instant Action Card that allows you to continue. 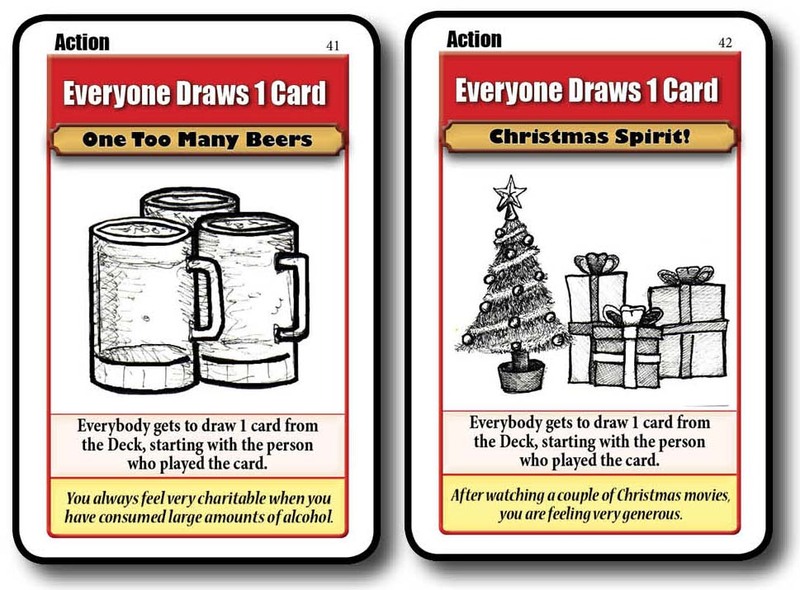 Everyone Draws one card (2) - Everyone draws one extra card. 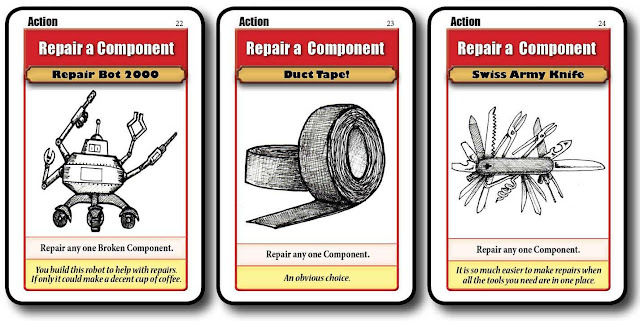 Repair all of your Components - Flip any of your cards that are Broken back to their upright position. 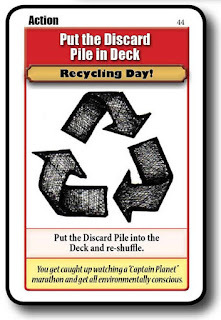 Put Discard Pile in Deck - Take the Discard Pile, put it in the Deck and Shuffle. Replace the Deck in the center of the table. Take an item from the Black Market - You can take a Component of your choice from the Black Market without needing to discard a Component. 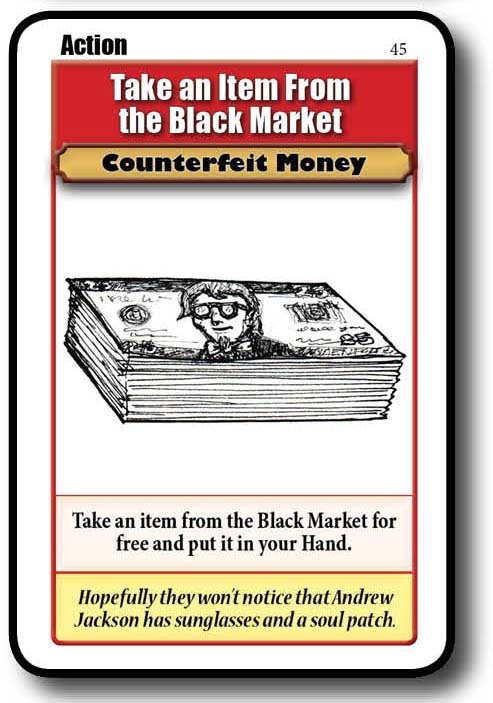 In the Long Game it must be a Black Market round to play this card. Everyone Discards one card - Everyone picks one card and discards it. Each set of Components are made up of four colors (Red, Blue, Purple and Green) and it will take one Component of each color to complete a doomsday device and win the game. Red is associated with propulsion or movement. It is a devices motor or engine, the thing that makes it move. Blue is the devices steering or guidance system. It’s what controls where the mechanism goes. Purple is the body or chassis of the device. It’s what houses all of the other components. Green is the thing that goes boom. The thing that triggers the doomsday event, or facilitates it happening. Playing a Component card is considered a single action and is placed in the player’s Secret Lab. 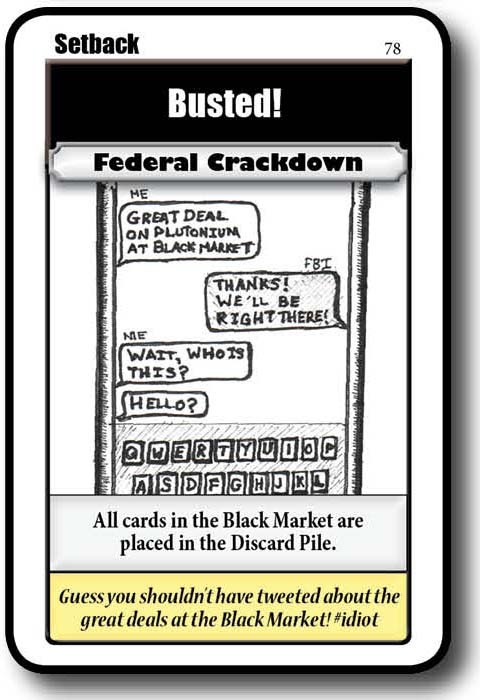 If a player ever has to discard a Component it is placed into the Black market, not the Discard pile, unless a card says specifically to place it in the Discard Pile. 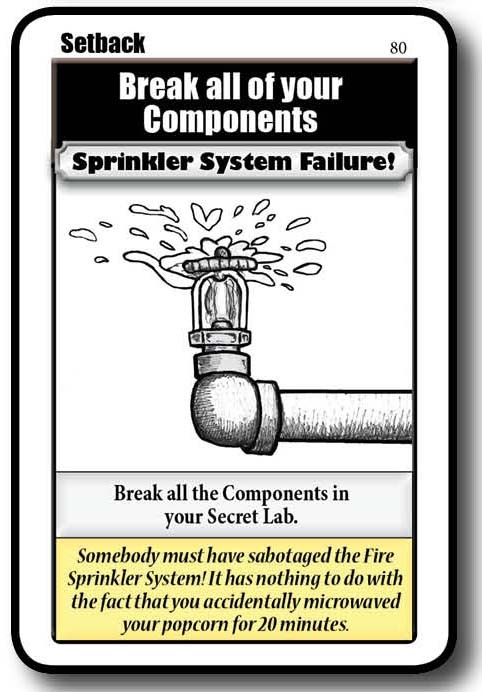 Components in a player’s lab may be damaged and repaired through card play. When a component is damaged it is turned so that the Broken text is on top. You cannot win if you have a Broken Component, so you must repair it first. There are numerous cards and abilities that will allow you to fix a Component. You can repair a component on any Color round if you are playing the long game. You can also replace any Component in your Lab with one in your Hand, whether it is Broken or not. Just place the new one in the Lab and the old Component card in the Black Market. Any cards that are attached to the card you’re replacing are put into the Discard pile. Any Broken Components that are put into the Black Market are no longer Broken. Enhancement Cards are unique cards that give a continuous benefit (or hindrance, see below) when in your lab. When played they count as an action and are placed in your Secret Lab. You may only have one Enhancement in your Lab at any time and the benefit provided by the card becomes immediately available when played. 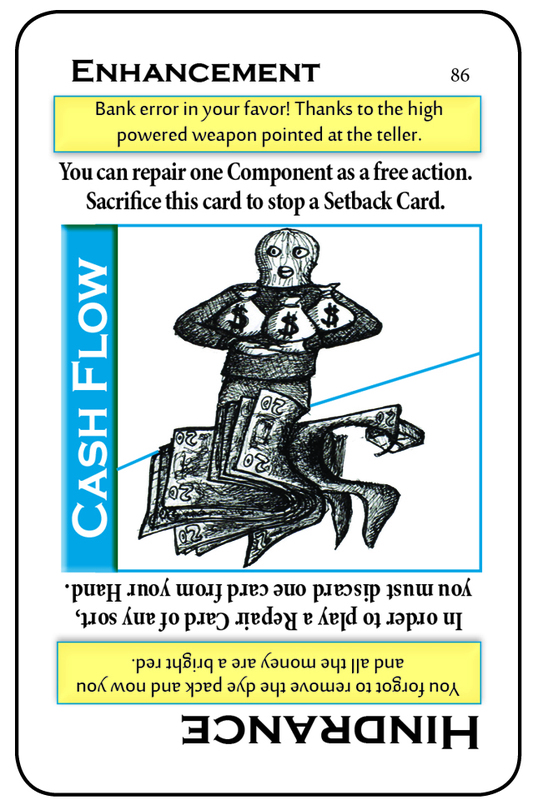 If you draw another Enhancement card that you think would work better for you, you can replace it. 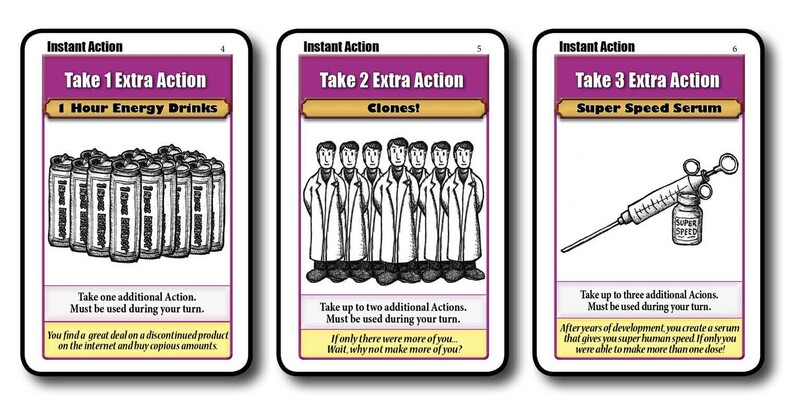 Play the new Enhancement in your Lab as an action and the unwanted one in the discard pile. You can play an Enhancement on another player if you wish, but only if they do not already have one in play. You can sacrifice an Enhancement (as long as it is not a Hindrance) to block the effects of any Setback Card. Whether it is your first draw or it is played on you by an opponent, simply DIscard the Enhancement and either continue your turn or whoever played it on you continues their turn. 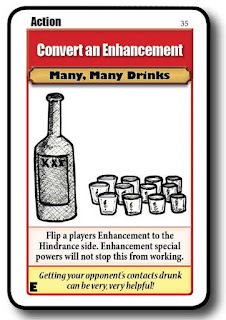 During play, there are several cards that will convert your Enhancement to a Hindrance. When this happens, turn the Enhancement card around so the Hindrance side is showing. You cannot sacrifice the card to block a Setback Card to get rid of it, though you can replace it with another Enhancement. 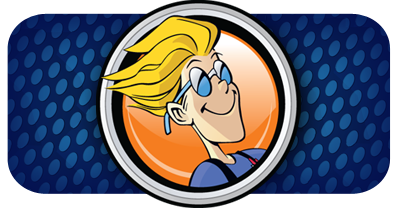 You can also play a Hindrance on an opponent that does not already have an Enhancement Card in their Secret Lab. As always, it costs an action to plat the card. The effect will begin the moment it is played. ie.If your hand limit is reduced you must discard extra cards immediately. 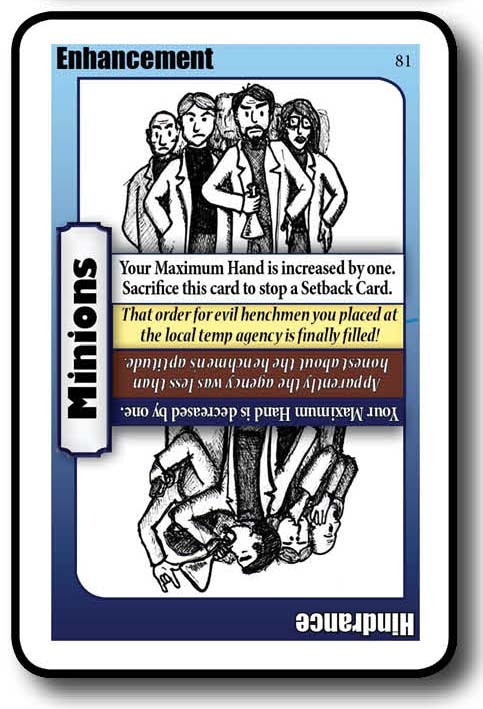 Minions - Enhancement: As long as this card is in your Lab your maximum hand is increased by one. Hindrance: When this Card is converted your maximum hand is decreased by one. You don’t discard the extra cards till your turn is over. 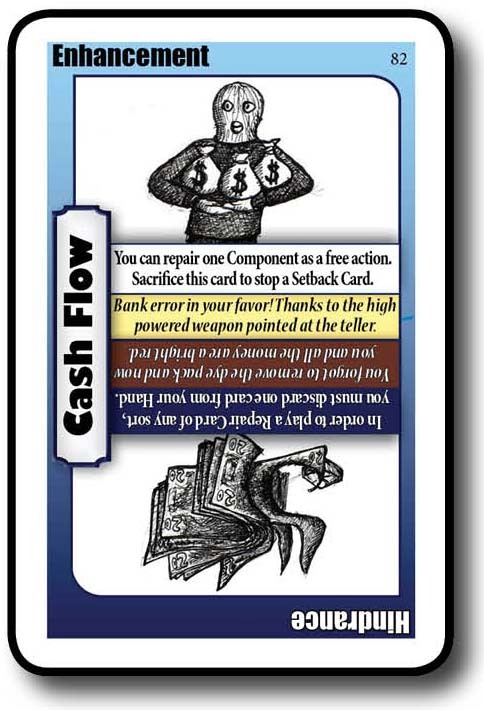 Cash Flow - Enhancement: As long as this card is in your Lab you can repair one Component as a free action. 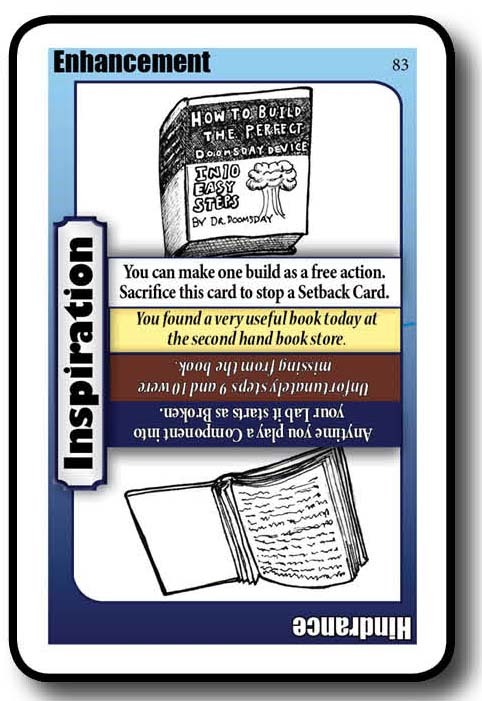 Hindrance: In order to play a Repair Card of any sort, you must discard one card from your Hand. Only one card needs to be discarded per repair card, no matter how many repairs the card grants. ie. If a player plays a card that gives them 2 actions and they play two Repair Cards, then they must discard 2 extra cards. If the same player plays a Repair All Components Card to repair his two broken he only has to discard 1 extra card. If you don’t have a card to discard, you cannot repair the Broken Component. 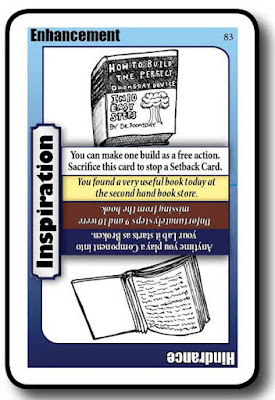 Inspiration - Enhancement: As long as this card is in your Lab you can place one Component into your Lab as a free action. Hindrance: Anytime you play a Component into your Lab it starts as Broken. Action card against you. This only blocks Action Cards, so Setback, Instant Actions and other Enhancement Cards will still work. Hindrance: You cannot use Action Cards against other player’s Components. 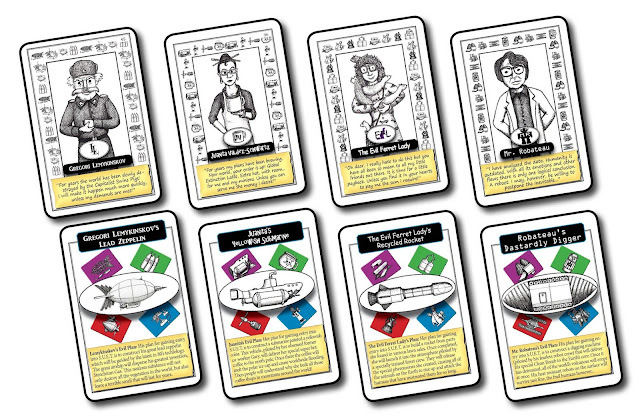 Setback Cards are designed to make life more difficult as players try to build their Doomsday Devices . When Setback Cards are drawn on the first draw of your turn, then whatever the negative effect of the card immediately affects you, Once you resolve the card’s effect, your turn ends. If the Setback does not affect you in anyway, you still end your turn. 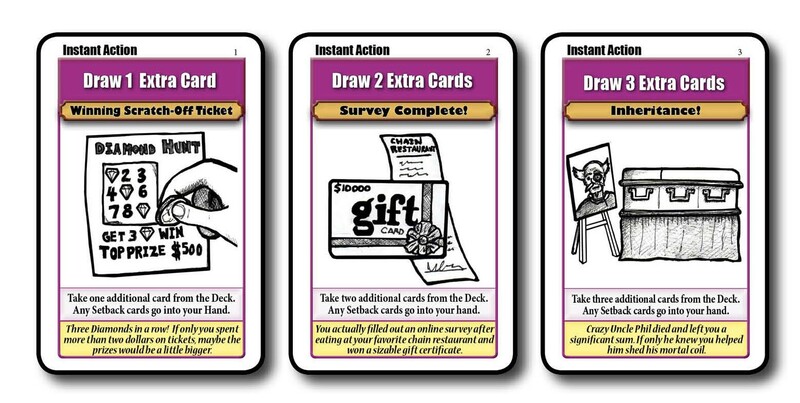 When Setback Cards are received in any other way than the initial draw, they go into the player’s Hand and can be played on other players just like other cards. Playing these cards against an opponent count as a single action and take effect immediately (or when it becomes applicable). Enhancement Cards can be discarded to prevent Setback Cards from working. Component Breaks (3) - When you draw this card then the player to the left chooses one the Components in your Lab and turns it to the Broken side. 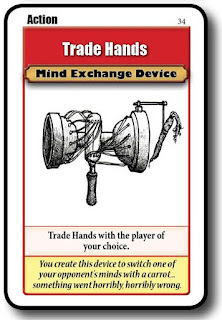 If you play this out of your hand on another player, you get to select the Component to Break. This card cannot be stopped by a Protection Enhancement Card. 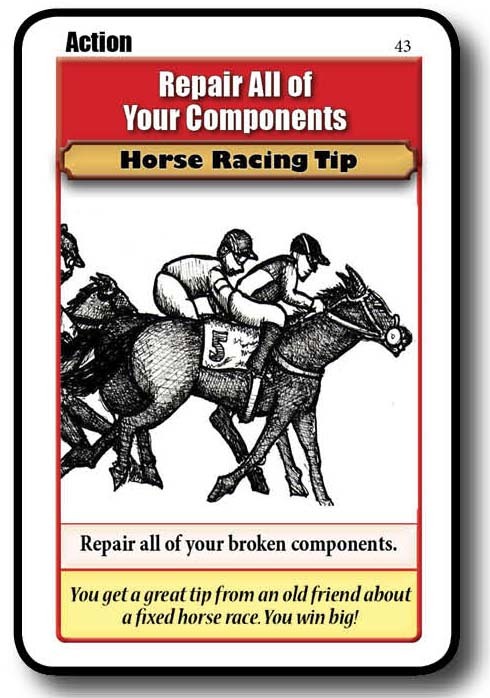 If you have no Components to break, then you lose your turn. 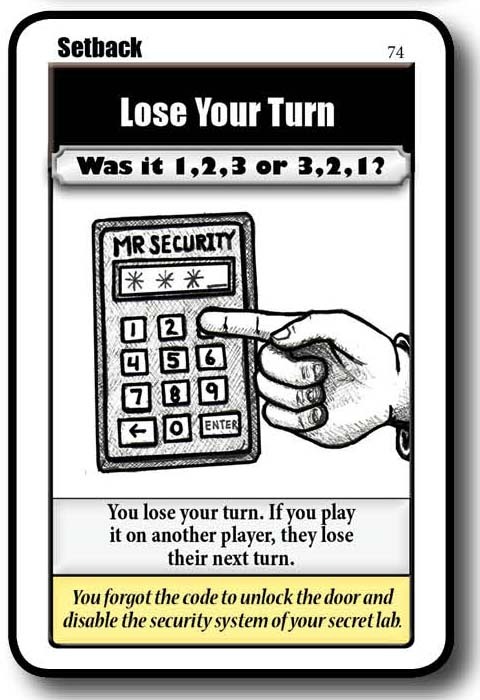 Lose Your Turn - When this card is drawn you immediately lose your turn. Discard down to your Maximum Hand and move on to the next player’s turn. If you play this on another player, they will lose their next turn. Just set the card in the affected player’s Lab and put it into effect on their next turn. Put One Back in Your Hand! 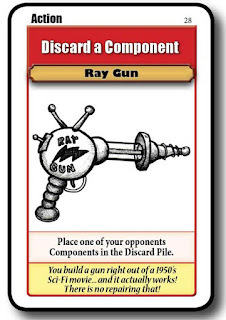 - If the player draws this card than the player to their left selects one of the Components in their Lab and they must put it back in their Hand. 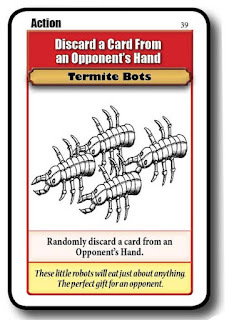 If you play this card on an opponent, you can select the Component that the player has to put in their Hand. Cheat cards are discarded in either situation. 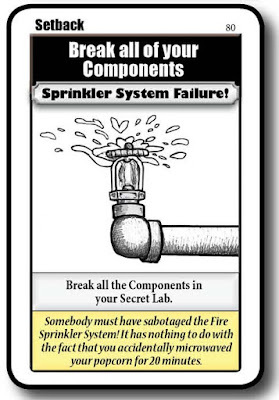 Break all of your Components - This card forces the player to break all of the Components that are in their Lab If you have no Components in your Lab, lose your turn. 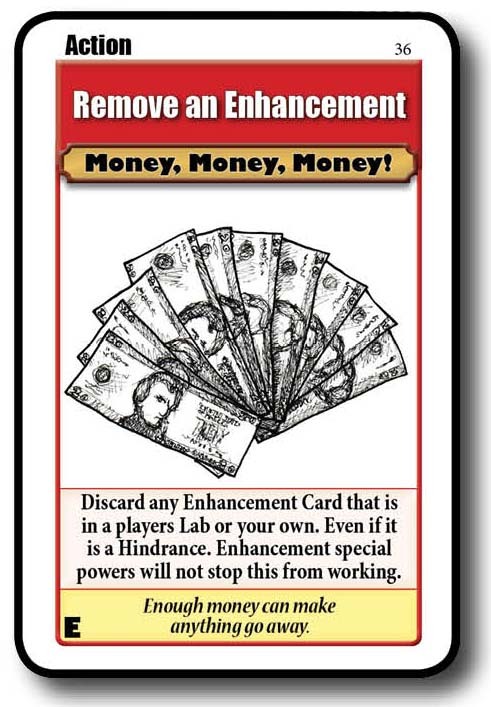 Lose Your Enhancement - If you have an Enhancement on your Lab, you must discard it. The Protection Enhancement does not prevent this. If you do not have an Enhancement, simply lose your turn. Busted! 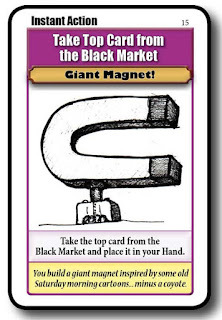 When this card is drawn or played, put all of the cards in the Black Market into the Discard Pile. 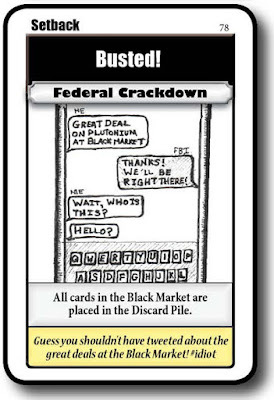 If there are no cards in the Black Market than you lose your turn. If you play this on someone else, the card stays in front of them until it is their turn, then they discard it and lose their turn. Return Components Back to Hand - Whoever receives this card has to take all of their Components from their Lab and place them in their Hand. All Cheat cards are discarded. If you have no Components in your Lab, or the person you play it on does not, then they lose their next turn. So you want to become a member of the Society of Ultimate Evil and Terror, huh? Well you've come to the right place. S.U.E.T. 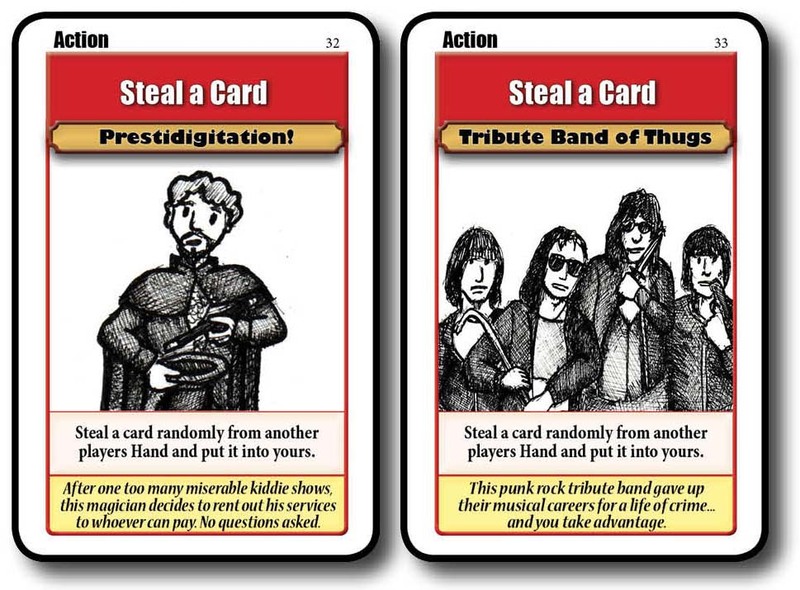 the Card Game is a game where you take the role of one of four evil geniuses trying to gain entry into this... illustrious(?) organization. Click and Like on Facebook! Copyright 2016 All Rights Reserved. Simple theme. Powered by Blogger.